There is an Istanbul derby taking place on Wednesday night and this looks like being one of the most intriguing games of the Euroleague this midweek. 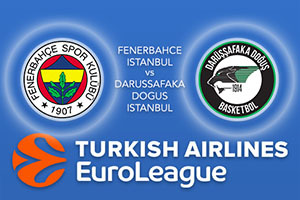 Both teams have a strong defensive shape, so there may not be a lot of points but with Fenerbahce holding an 8-4 record while Darussafaka hold a 6-6 record, there is sure to be a lot at stake. This is definitely the sort of game that provides interesting basketball betting options. The hosts fell to a defeat last week, so they will view this game as a chance to get back to winning ways. The fact that this is a clash between two domestic rivals means that it carries its own intensity and drama. The sides met last season for the first time in European competition and Fenerbahce were the winning team on both occasions. The hosts will definitely look towards Kostas Sloukas, who provides an average of 12.4 points per game this season while Ekpe Udoh has offered up an average of 11.6 points per game. Jan Vesely has also been in fine form, providing an average of 11.1 points per game and these will be the players the home fans rely on. Although this is an away tie for Darussafaka, the fact that they are playing in their home city is ideal when you consider this is a double week in the Euroleague. The away team will hope that the passion and fire of derby day in Istanbul gives them an improved chance of grabbing a result that will see them rise up the table. Brad Wanamaker has been in decent form so far this season, offering an average of 14.2 points per game. This included a career high for the player of 27 points, which came in the victory over Real Madrid last week. Other players who have performed well for Darussafaka this season include Will Clyburn, who has provided an average of 13.2 points per game and James Anderson, with an average of 10.9 points per game. Take Fenerbahce Istanbul at -6.5, at odds of 1.90. If you’re looking for the Over/Under market, look to go UNDER 153.5 at odds of 1.90. Bet Now!